The radial design uses a fixed wheel spinning on an axle surrounded by a circular track for a frisbee. By doing this there it simultaneously adds speed to the frisbee using the rotating wheel and spin using the far wall of the track that is padded with self-insulating electrical tape for increased grip. We used many different iterations of motors starting with Dewalt drills, but opted for more power using pneumatic drills running off shop air spinning the wheel at 5250 RPM. Using the higher RPM we were able to semi-accurately shoot from 10ft away from the high goal. The idea was created as a derivative of the Radius design, coming from the need for a compact shooting mechanism. 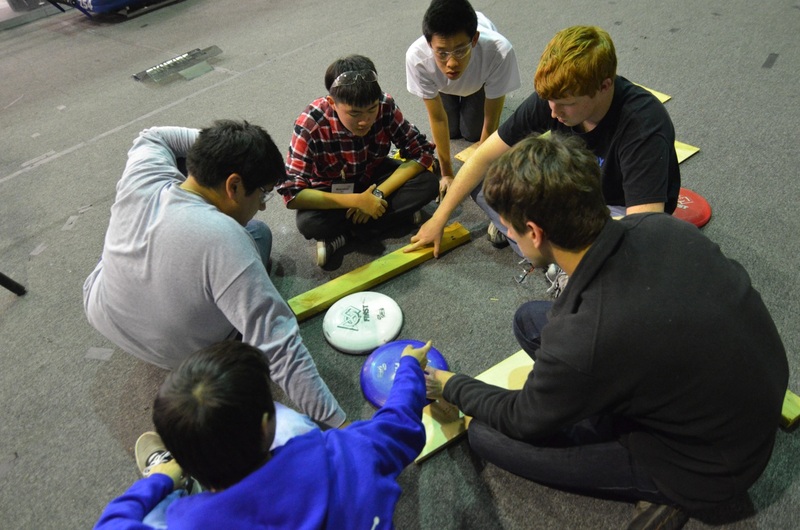 Utilizing the same idea of a static surface combined with a spinning propellant, we designed a system that uses a direct mounted CIM motor to power a timing belt pulley system to increase speed of the frisbee in a single linear movement. Acquire missing pyramid parts, assemble pyramid base and goal, assemble pyramid. Today the team got a great start as soon as we could access the lab, making substantial progress on a multitude of projects. The decision was made to build a modified version of the 2011 drive system which operated a 6 Wheel Drivetrain System with two speed gearboxes (high gear at 19.8fps, low gear at 7fps). Center wheels are lowered to allow for maximum maneuverability. 3.5″ wheels keep the robot center of gravity very low to the ground. Additional design improvements have been pushed to tomorrow for final decisions. 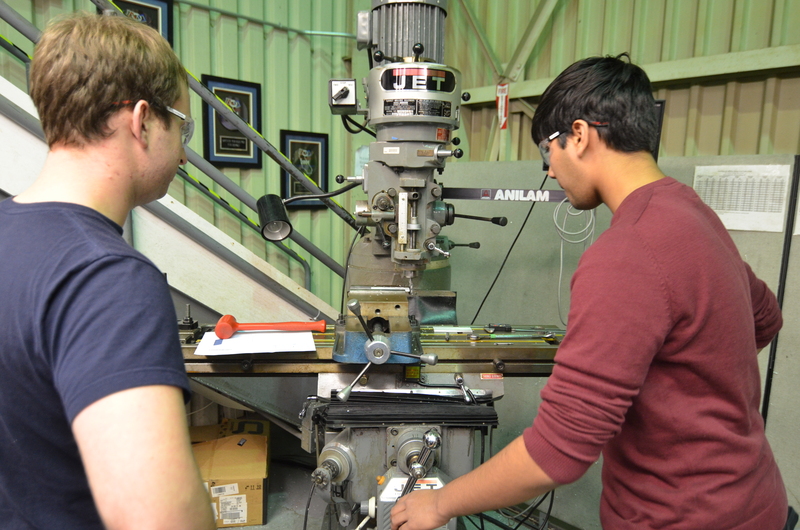 The team is still in the process of brainstorming designs for both intake and climbing/hanging mechanisms. 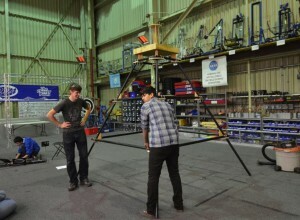 Students completed all components and assembly of the pyramid, creating a solid basis for hanging prototype testing. 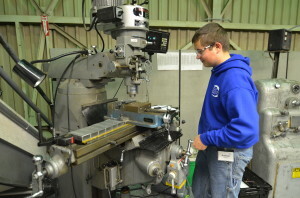 The CNC mill was used to mill components for the linear shooter prototype and is prepared to be in around-the-clock machining as soon as the preliminary metal shipment has arrived. 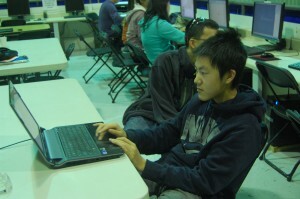 The programmers began to write some code in Java to deploy to the 2012 robot. They used the CommandBasedRobot structure for the code, and fixed all previous errors that popped up before during deployment. The code was deployed and ran successfully. Currently, the team has a completed drive subsystem and a couple drive commands. In addition, some students worked on a system to read values from a file for on-the-go constants editing. Today was the first weekday of build and with fewer member attendances, there was a lot of individual work getting done. Majority of time was spent in conversation between students and mentors on design decisions. 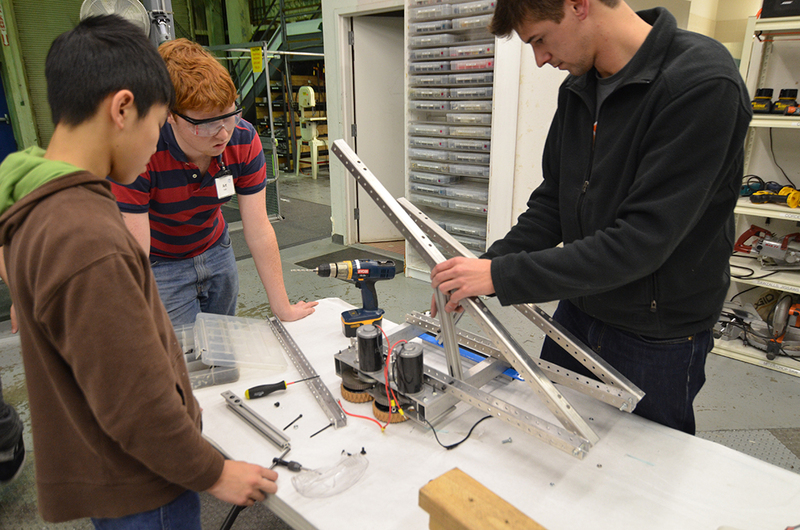 Mentors and students continued designing the robot baseplate and the drivebase in Solidworks. The drivebase was completed before Nagy lost all his work. It will be completed tomorrow at school. 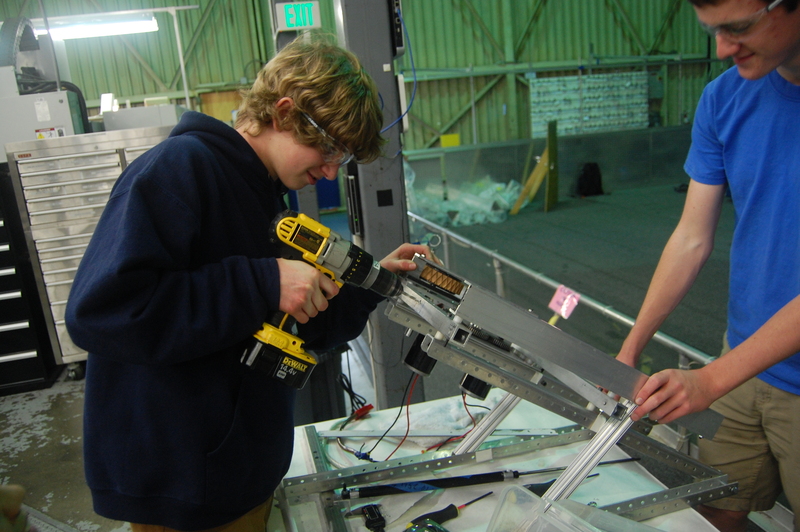 Students began to install 4 new Talon speed controllers on the 2012 robot Skyfire drive motors to replace the Victor speed controllers. Later on, the Talons will be tested and then based on results, the team can decide which speed controller to use for competition. The programming team worked on implementing a trapezoidal motion profile to accompany PID control, which involved quite a bit of math. Meanwhile, other programmers continued working on a way to read constants’ values from a text file, and update the constants accordingly. Tomorrow, we hope to make adjustments to the code to use Talons instead of Victors, and test drive the 2012 robot. I received a couple of requests for the cookie recipe from Kickoff weekend, so I'll just post it here on the build blog. Stay tuned for future weekly deliciousness and nutritiousness! Cream butter, sugars and vanilla extract. Add egg, milk and cocoa; beat. Add flour and baking soda and mix just until blended. Stir in chocolate chips. Drop on cookie sheet and bake at 350°F for 12 minutes. 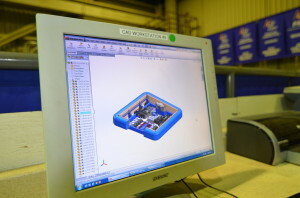 To help manage the robot parts in CAD and their manufacturing status, there is a new web-based part management system located at parts.team254.com. 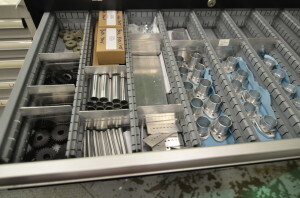 This system assigns official part numbers, stores information about parts and the materials required to make them, and shows the current manufacturing status of each part. Day #4: Success with Intake and Shooter! Today was a huge improvement in student attendance over yesterday. With our first active weekday build, a majority of the time was spent designing and beginning initial prototyping of an intake mechanism. Students worked in a group to brainstorm ideas for an intake mechanism that will allow the robot to take in discs from the ground. One of the several ideas brought up include horizontal rollers to roll the discs in. However, the orientation of the disc (facing upwards or downwards) and friction between the carpet and the disc are challenges. Currently, one new intake prototype has been constructed that can take in discs on the ground from either orientation. 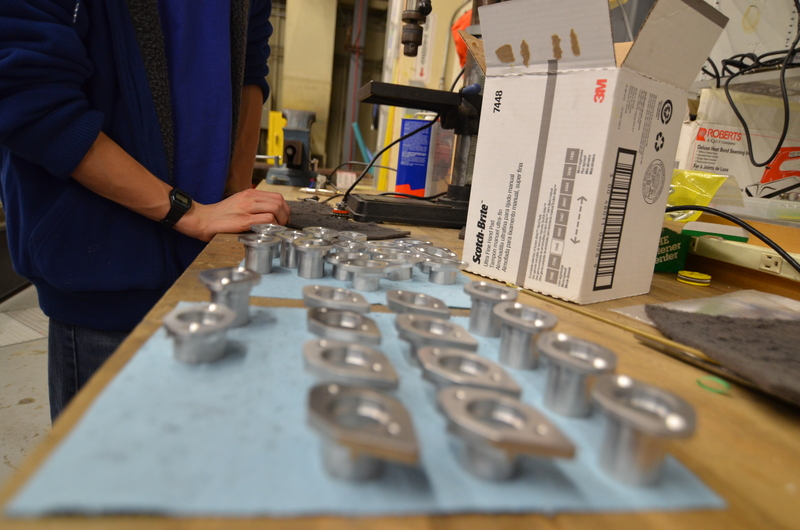 Additionally, some students are continuing work on manufacturing parts for shooter prototypes. 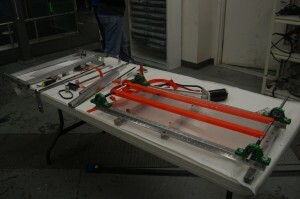 One new shooter prototype that is under construction is a linear shooter, powered by two wheels. One wheel will be powered such that it is faster than the other. 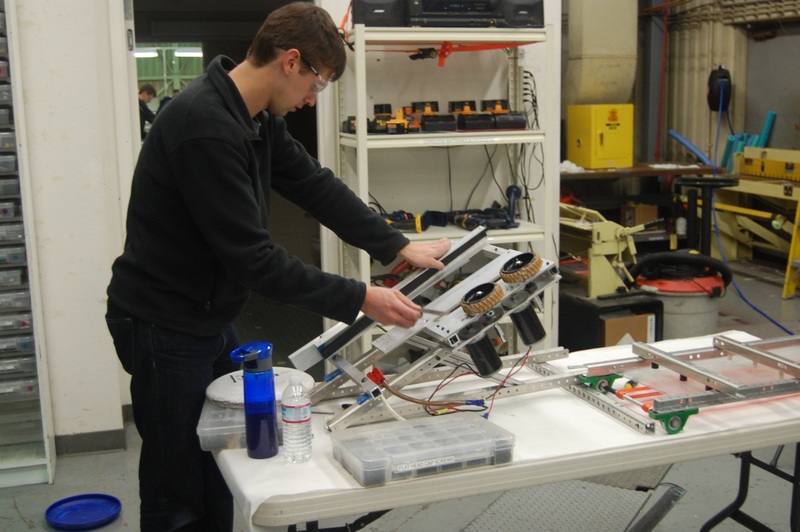 Some students are using the drivebase of the 2010 robot, Onslaught, in order to test shooting and future intake prototypes. Currently, there is a problem with power to the cRIO, which prevents controlling or deploying code to the robot. Once the 2010 robot is up and running, the team will attach prototypes to the robot to test out prototypes on the field, while driving. The programmers discovered that original idea to use Java reflection will not work because the robot uses Java ME (mobile edition), which does not support this feature. 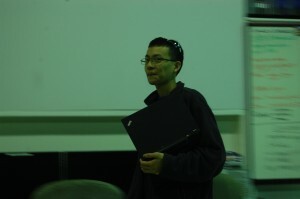 They brainstormed some other possible solutions including using a hash map for storing variables read from a file, but it is likely unfeasible due to its heavy computational expense. Another idea is to use a flat text file with constant values that can be transferred to the robot without re-compiling and re-deploying code. In addition, the programming team tested out a Logitech game controller as a way of driving the robot. The analog sticks on the controller were successfully used to control the drive. More comparisons and tests between joysticks and the game controller will occur later on in the season. 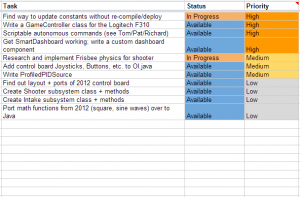 In order to keep track of programming-related action items for FRC, we've created a spreadsheet with tasks that are sorted by priority. If you're ever at the lab and want to do some programming, swing by and choose a task that interests you. We hope that this list will make it easier for you to find a cool project to work on while in the lab. As always, you can let Richard, Stephen, Tom, or Pat if you have any questions or need clarification. Be sure to read the blog often to check out our programming progress! Today was a very productive day at the lab. There was a lot of progress made in many areas. Improvements were made to the shooter prototype. After students replaced a faulty CIM motor, an adjustable base was added to the linear shooter to allow testing at multiple angles. This base will help optimize the perfect angle for shooting a frisbee. The base was constructed out of kitbot parts and 80-20 extrusion. 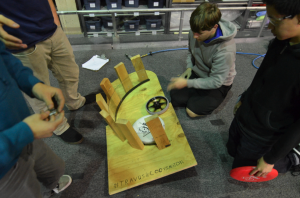 Students worked on improving the roller-intake prototype by testing different kinds of tread spinning at different speeds. It was found (unsurprisingly) that the roller must be spinning very quickly (about 2,000 RPM) to intake the frisbee. Long rough-top tread attached as "fingers" did not work well. A piece of rough-top tread that was wrapped around the roller worked the best. 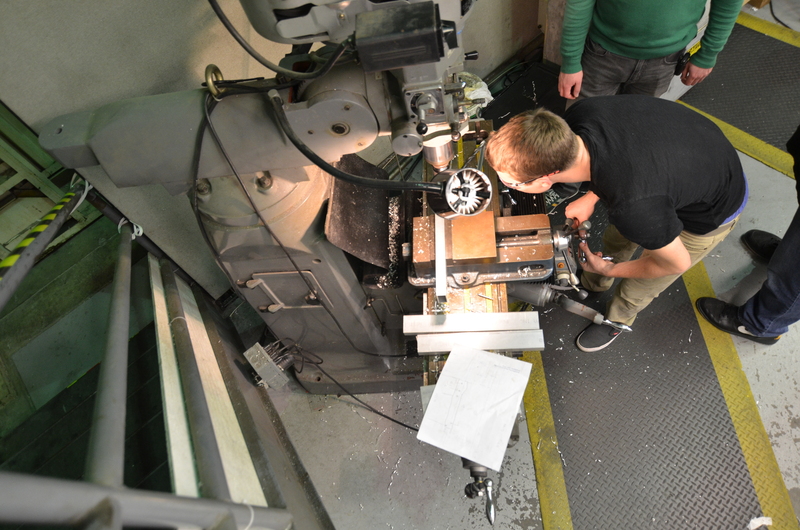 After determining this improved treading configuration, students and mentors worked on setting up the prototype as an over-the-bumper intake. Rather than sucking-in the frisbee horizontally, tests were conducted to see if the frisbee could make a smooth and easy transition from a horizontal position on the ground to an angled position over the bumper. 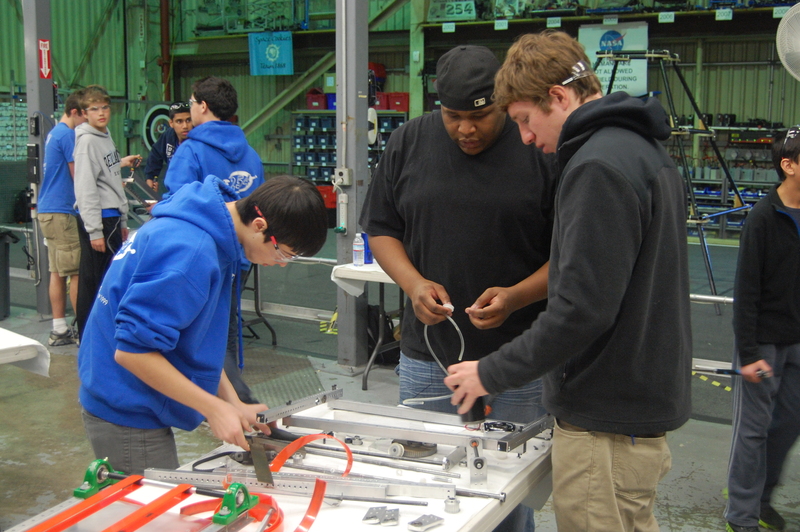 Students continued to attempt to restore the 2010 drive base, in order to attach prototypes and drive around. After an hour of debugging, it was concluded that a faulty cRIO was on the robot. The efforts were abandoned because of a lack of replacement cRIO. Hopefully, a new cRIO is acquired soon in order to continue testing. Restoring the drivebase was also supposed to be an excercise for the new programmers, so they could practice writing brand new code and uploading it to a functioning robot. Tom dropped some knowledge bombs on the programmers today. Students continued to brainstorm and discuss possible ways of updating values without having to re-compile or re-deploy the code. Some ideas that was brought up was having a text file for each constant, or having an "isModified" boolean value somewhere. An action item specific to programming was created yesterday. This is essentially a to-do list, which organizes and tracks tasks what need to be completed and the priorities of tasks. 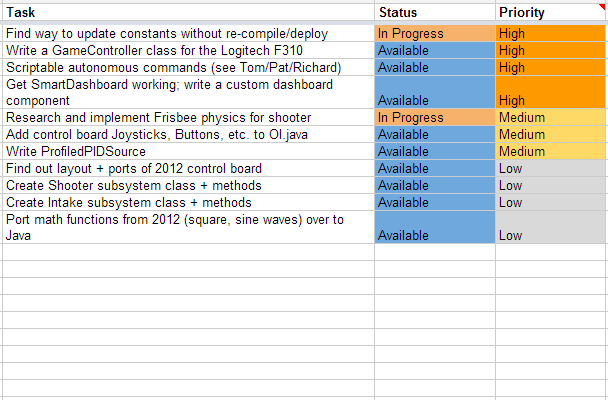 This list should make it easier for students at the lab to more easily contribute to programming effort. Two students worked on modeling a project box and the components to go inside it. This project box will house a power supply and will be the control box for the lights hanging on the trussing in the pit area. 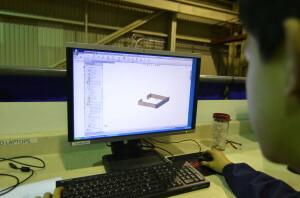 A student modeling the project box in SolidWorks. Complete drivetrain design. Deadline is Friday. 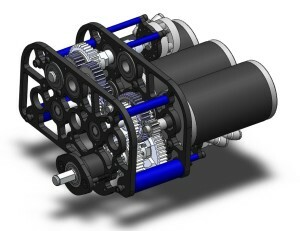 It was decided that a power take-off (PTO) mechanism will be implemented into our drivebase gearbox design. A power take off simply allows all the power from the drivebase gearbox to be applied somewhere else. This is achieved by adding an extra output shaft to the gearbox with a another shifter, giving the gearbox 3 "speeds". There is the high speed, low speed, and "neutral" speed. Neutral will inhibit the wheels from receiving power and allow our hanging mechanism to be fully powered by six CIM motors (the most powerful motors in the Kit of Parts). Implementing the PTO will give the hanging mechanism the maximum amount of power (since the motors allowed are limited) thus allowing the robot to hang as quickly as possible. Today's progress included adding a third CIM motor to the gearbox and changing the configuration of the motors to allow for a second shifter and second output shaft. This gearbox will be the biggest, heaviest, and most powerful gearbox Team 254 has ever built! It will be called "Big Daddy!" 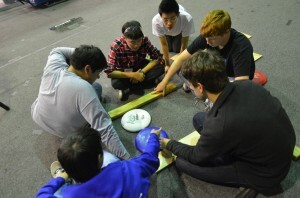 to compliment 2011's enormous intake gearbox, which was crowned "Big Momma"
Students worked on prototyping an intermediate conveyor system which will be used to transfer the frisbees from the intake to a second mechanism which will transfer the frisbees to the shooter. The second mechanism has not been prototyped as of now. 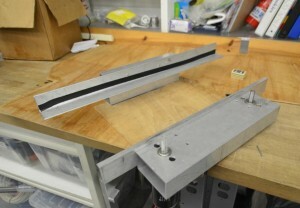 This prototype currently uses timing belts that are connected to two horizontal rollers. These rollers are currently running at 1400 rotations per minute. As of now the prototype works as long as it is tilted less than thirty degrees from the ground. 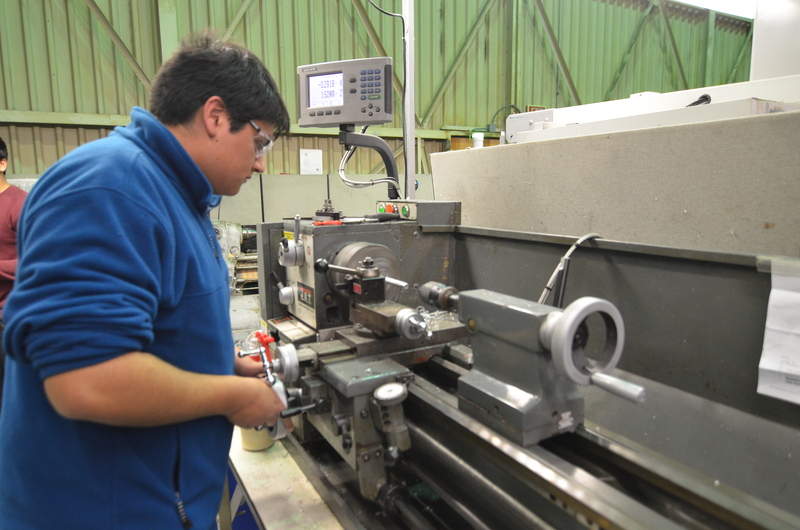 When the prototype is angled more than thirty degrees from the ground, a pressure must be exerted perpendicular to the rollers for it to work. 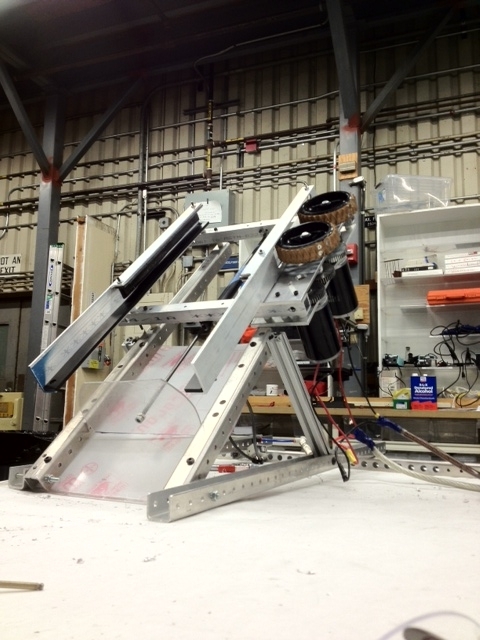 The shooter prototype was repeatedly tested, and it fires consistently when the frisbees are right side up. However the consistency is lost when the frisbees are placed upside down. As of now, we would like to add something that would prevent the frisbee from angling upwards before it exits the shooter. Students added bearings to the rollers in the prototype to prevent the loud clacking noise that occurs when it is operated. 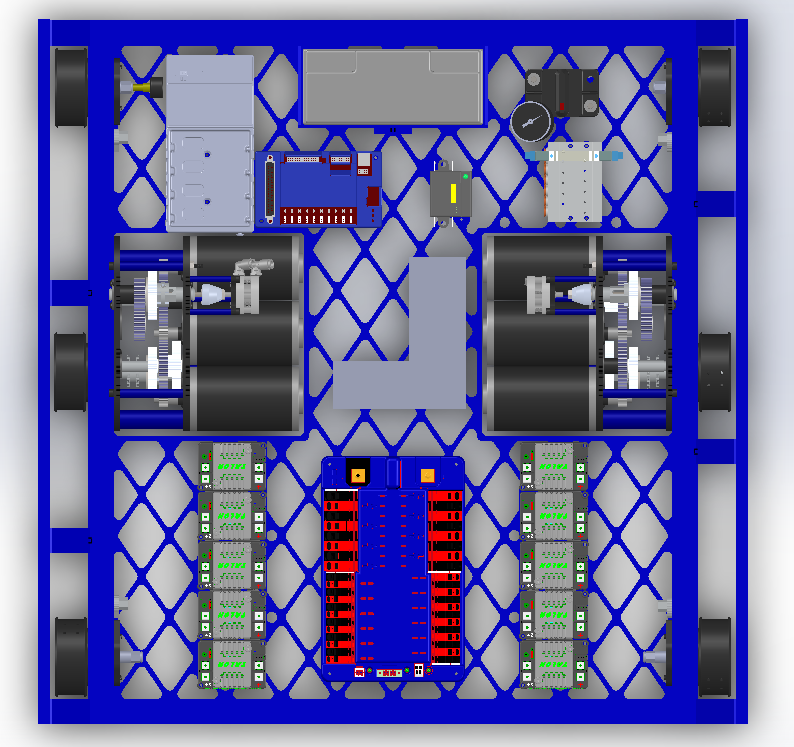 Students finished the CAD for the LED Power Box and components. This will be assembled later and used for the pit area trussing. With a new to-do list to keep track of action items, a multitude of programming-related tasks were completed or started. Students worked on getting constant variables to read from a file for the robot code. 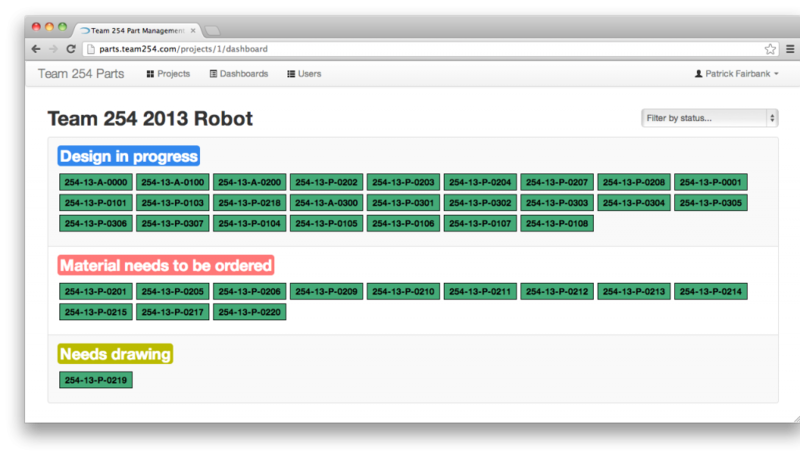 This updating would happen in robotInit(), right as the robot turns on. They also worked on reading autonomous scripts from a file for the robot in such a manner that these scripts deployable without re-compiling. Since they don't have the actual autonomous functions yet, programmers have created an initial structure to parse in names of the commands and their parameter(s) from a text file. The Smart Dashboard was installed on the driver station. Tomorrow, programmers will work on creating custom widgets to place on the dashboard. Lastly, programmers imported math functions from the 2012 robot code into the 2013 robot code. 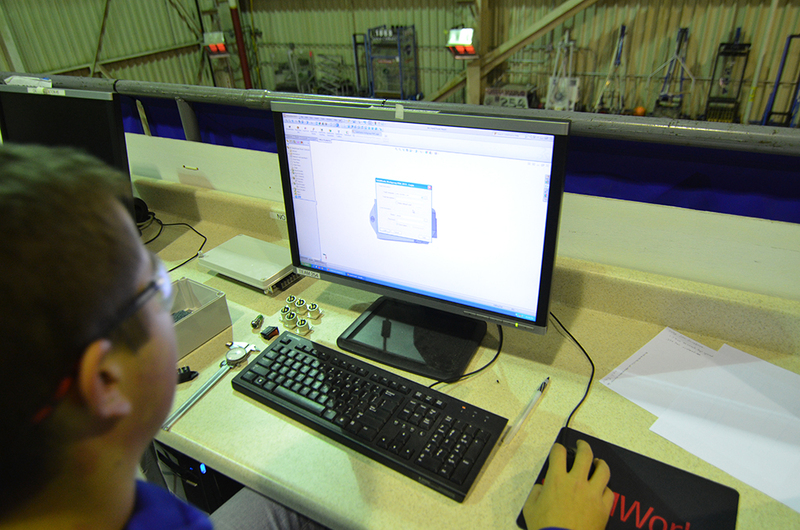 The team continued to refine the conveyer prototype. The team started out by opening up the new polyurathane belts that came today, and proceeded to brainstorm on how they could improve the conveyer. The team decided on three things. The old system continued to have slippage with the timing belts, and thought the new polyurathane belts would solve this issue. The team cut the belts to the correct length, fused them together, and stretched them over the place where the old belts were. The new compression device posed a new problem, screws sticking out of it, holding the frisbee back from free movement. The team solved this issue by using a technique called countersinking, where a divet is drilled around the area of the screw, allowing it to rest out of harms way. This completely solved the issue of the frisbee getting stuck. The 1×2 tubing was replaced with 1×1 tubing in order to raise the wheels higher so that they would contact the disc in an upside down orientation. The left side wall was shortened to try and make the discs go straight instead of off to the right. The stand for the shooter was improved such that it sits flat without being held down. Shooting upside down was very inaccurate because even with raised wheels, the wheels still push the disc up. U-channel needs to be added on both sides to keep the disc in line. With the shortened left side wall, the discs did not fly straight, they flew to the right. With U-channel added on both sides, and past the wheels, the discs should fly straight as they exit the shooter. Then programmers updated the 8-wheel 2010 drive base to work with Talons. It will be used to mount the prototype intake and shooter. The team also made the robot controllable with the Logitech gamepad. 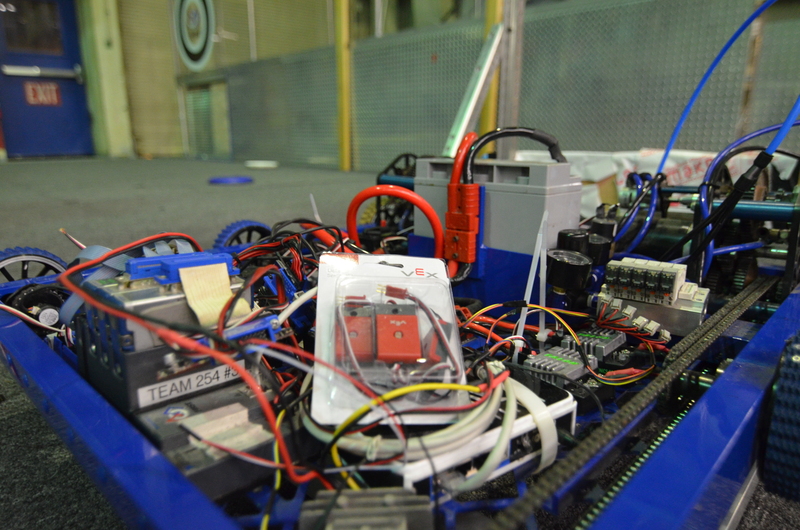 A few members and mentors drove the robot around the field with the new controller. There is no new progress on the constant file reading system nor the autonomous command system. 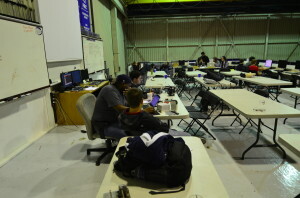 Tomorrow, the programmers will work on the autonomous command system, the gamepad controls, and constant file reading. The intake was totally redesigned in Solidworks today. 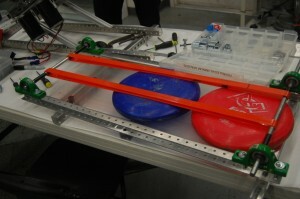 The design features multiple sets of belts to move the frisbees around. It uses belts on the bottom to increase the friction between the disc and the polycarbonate sheet. In total, 11 belts need to be manufactured and welded. The newly designed intake prototype is currently under development. Students made changes and modifications to the shooter prototype. 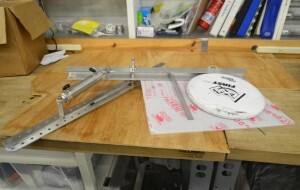 C-channels were added on the left and right side of the prototype to guide the frisbee as it travels through the shooter's wheels, preventing it from moving upwards and adding stability. In addition, new parts and attachments for the shooter were milled and manufactured. The shooting prototype was tested extensively. As the results show, the frisbees that were fired were somewhat accurate. The orientation of the frisbee (upside-down vs. right-side-up) appears to have a slight influence on the trajectory of the frisbee. An upside-down frisbee ends up at a smaller height than the height of a right-side-up frisbee. 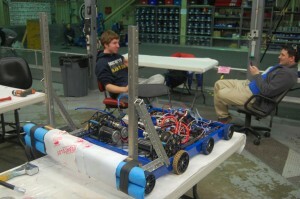 Makeshift bumpers were added to the 2010 robot today. 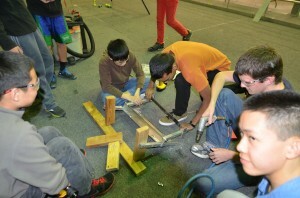 The bumpers were constructed out of pool noodles, which the students will use to create the real bumpers from later on. 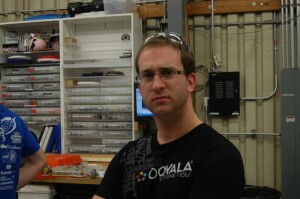 The team hopes to use the 2010 robot's drivebase to attach and test the intake and shooter prototypes upon their completion. Metal frames were also installed on the robot. With these bumpers, students can test the intake mechanism as if it were on the real robot. The programmers worked on a multitude of tasks today. Some students worked on a custom Smart Dashboard widget that would populate a text file with a constant's name and value, then upload the file to the robot with FTP. Currently, the widget is working, but students still have to investigate problems with the FTP connection. Students also worked on automous command scripting. With this, the robot can read autonomous commands from a text file on the robot, and execute them. The benefit of this method is that the team won't have to re-compile or re-deploy the code in order to make one small modification to the autonomous. Currently, the system is working as intended. The robot was able to interpret the drive and wait commands. Lastly, the programmers continued to work on reading constants from a file. This has not yet been completed, but the students have a general idea and framework for what needs to be written. This is a prime example of our foremost Canadian mentor in his natural state of observation and intense thought about the world of robots. Lab closing time was 12:50 A.M. 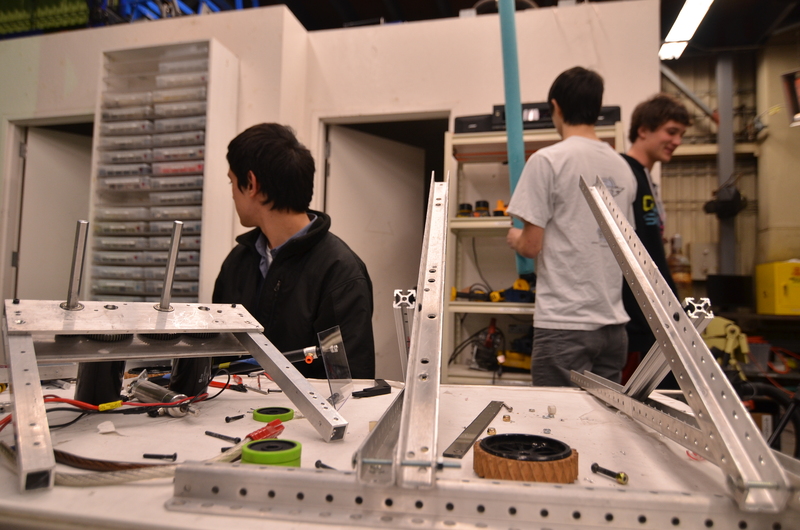 The team is now a week into the short 6 week FIRST Robotics build season. We've made a ton of progress on everything from design and prototyping to field construction and programming. We have built the pyramid from the field drawings and have come up with a ton of concepts for various game challenges, some of which have been tested. The programming team has been working to get old robots up and running both for programming practice and for testing prototypes. The team is in agreement that Ultimate Ascent, this year's FIRST challenge, is one of the harder games in recent FIRST history. However, we're happy with the prototypes that we've been working on and are confident that we'll be able to pull together a robot to play the game.  Team 254 works on a different schedule than many other FRC teams, designing and manufacturing parts in parallel. 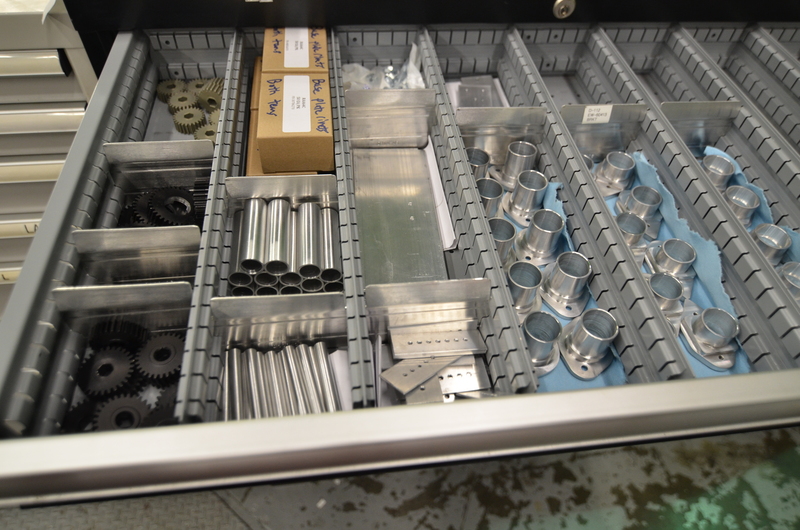 This forces us to design sequentially and finalize parts as soon as they are ready so they can be made in time. For example, some robot parts were designed on day two and sent out to sponsors on day three of the build season. As we move into week two, the focus is on continuing to prototype designs and trying to lock down some aspects of the robot design so that we can send more parts out to sponsors by the beginning of week three. It'll be busy but we think we can do it. Students have made a couple of modifications to the shooter prototype. An L channel was added, in addition to guide rails. A pneumatic piston was attached to the shooter to load the frisbees into the shooter wheels. The goal was to make a shooter that could shoot frisbees both upside down and right side up. After making the modifications and adding the "autoloader" the shots became more consistent (because of the same loading dynamics). However, the upside down shots and the right side up shots were aiming differently. The most significant difference is the flying dynamics. The upside down frisbees were more unpredictable and didn't fly as well. Not much was changed on the conveyor. Upon the completion of the shooter and intake, students will integrate the conveyor design with the two other prototypes. The team took a new route with the design of the intake. They removed some of the orange polyurathane belts in the process. A new intake was constructed from the CAD. Though it works fairly well, the team is working on improving it. It can't quite take two frisbees at the same, but can still pick them up quickly. The design is based on the old conveyor prototype and old intake prototype. At the end of the night, the intake was fully functional and was able to funnel two frisbees into one. It was also able to easily pick up the frisbee from the ground, albeit not as well as was hoped. The intake so far is not fast enough and not consistent enough. More work will be done on it tomorrow. The programmers worked on a Smart Dashboard widget for writing constants and their values to a text file, and uploading them to the robot using FTP. They first worked on the layout of the widget, and were successful in the writing and clearing functionalities. However, the programmers still had issues creating an FTPClient object and connecting to the robot. Students also wrote a Turn Command for use during autonomous mode. The ScriptedAutoReader was configured to read the word "TURN" as a TurnCommand and appropriately create one. It seems to work, but the command still requires extensive testing, since the command depends on the gyroscope and the robot was left on the stand. The pyramid was fixed. The top goal of the pyramid was brought down for some adjustments, and then reattached. 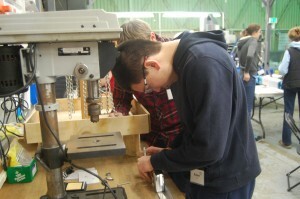 Today was our first down day for FRC build. This post will recap a few of the design decisions and design progress so far. There will be a square drivebase on the robot. This was decided up for the following reasons. The square configuration will give more room for the intake. One of the updated rules was that the the robot cannot exceed a 54" cylinder. Because of this, the shorter and wider robot will allow for more room in the intake to drop down. After finalizing the size and dimensions of our drivebase, the next step was to complete the layout of electronics on the baseplate. 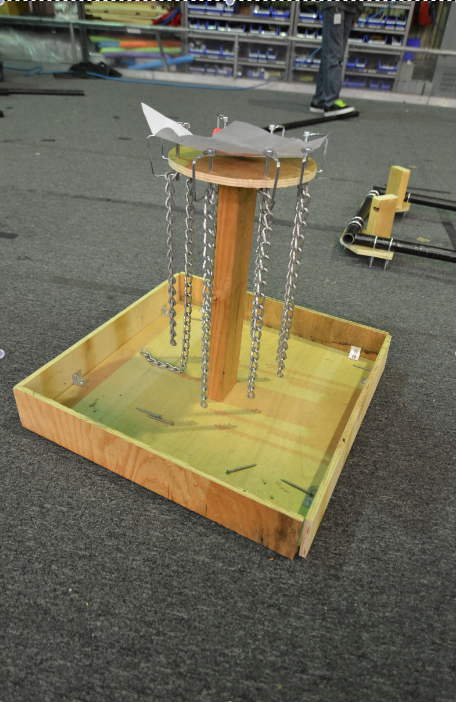 The batter will go towards the back of the robot (away from the intake) to balance out the center of gravity. 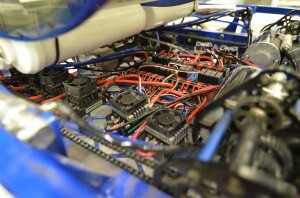 The talon speed controllers will be at the front along with the power distribution board. These were all layed out in the CAD model and mounting holes were put in the baseplate. The raw material for the baseplate was cut and was sent to BAE Systems. The baseplate will get waterjetted by BAE and hopefully sent back by the end of the week. See above for the electronics layout. It was decided that the bumpers will have a cutout to allow the intake to drop down. The intake will bring the frisbees over the frame rail, but not the bumper. Having the cutout will allow the intake to drop down on a pivot that is lower down. This will give the intake a smaller profile when pivoting down allowing for a bigger intake when fully extended. The shooter retained most of its current form in terms of design, some new pieces were just added on. A system for indexing and stacking frisbees was designed and implemented on the prototype shooter, so that it will be able to load several frisbees. The programming team had an effiecient day today. Firstly, they worked on the autonomous script and selector. The programmers hope to cycle between hard-coded and on-the-fly autonomous sequences with a press of a button. Secondly, they worked on the Smart Dashboard and the GUI. The team managed to get the FTP connection to work. It turns out that the Apache Commons jar should be placed in the lib/ directory of the Smart Dashboard folder. This has yet to be tested on the driver station laptop, which will be done tomorrow. 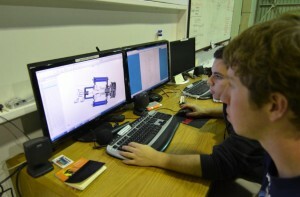 Finally, they started designing the control board and creating the corresponding list of parts. 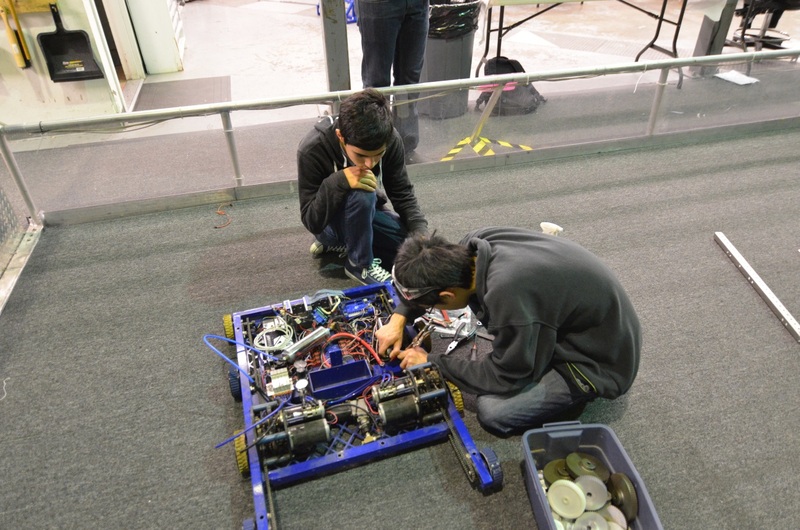 The team decided on driver and operator controls, such as joysticks, buttons, and switches for the robot's functions. Students also decided on the sensors that would go in the robot (encoders, gyro, etc). The design of the robot has been coming along slowly but steadily. The team decided on a 6 motor drivetrain utilizing 6 CIM motors. Furthermore, each drive gearbox has a Power Take-Off (PTO) which could be used later to power a hanging mechanism. 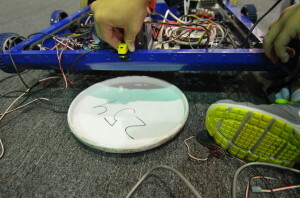 After intake prototypes illuminated potential difficulties bringing disks up such a steep angle, it was brought up that a wider robot would allow for a gap in the bumpers for frisbees to travel through. After a long discussion, this route was pursued and the drivebase weldment (assembly 254-13-A-0300) was finalized and the base plate was sent out for manufacturing by sponsor BAE Systems. 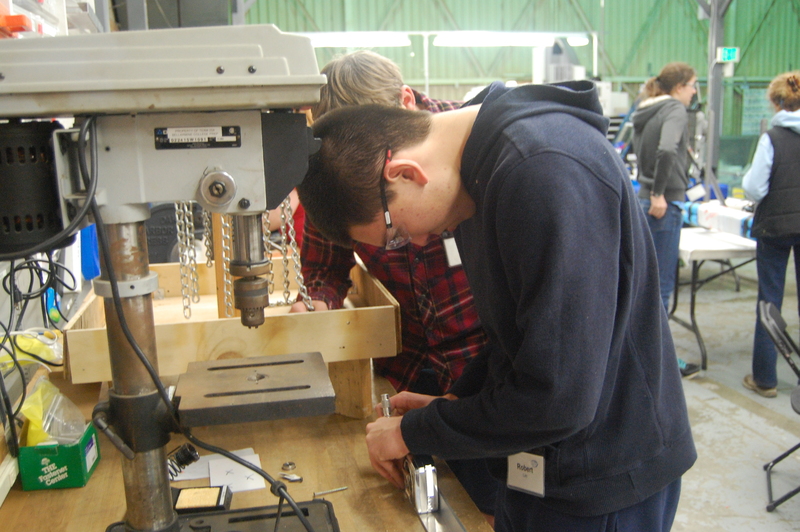 With the drivebase weldment finalized, students worked to make CAD drawings for the components of the weldment. Furthemore, the control board design began. The shipment from Coast Aluminum arrived. It was taken apart, checked and stored with the other aluminum. Some of it was cut to begin manufacturing a few of the smaller parts. Several changes are being made to the shooter prototype. First, students began installing smaller diameter wheels in place of the larger diameter wedgetop treaded wheels. This is because the smaller wheels would have lighter weight and would allow the shooter to occupy less space. In addition, a team on Chief Delphi forums tried them out and reported that this method worked well for them. 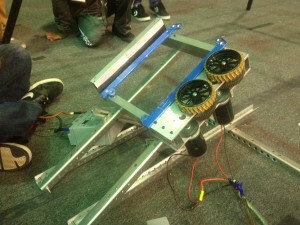 Next, the team is in the process of turning shooter upside down to allow frisbees to be fed from the bottom. This would make it easier for the intake and conveyor system to feed frisbees directly into the shooter. 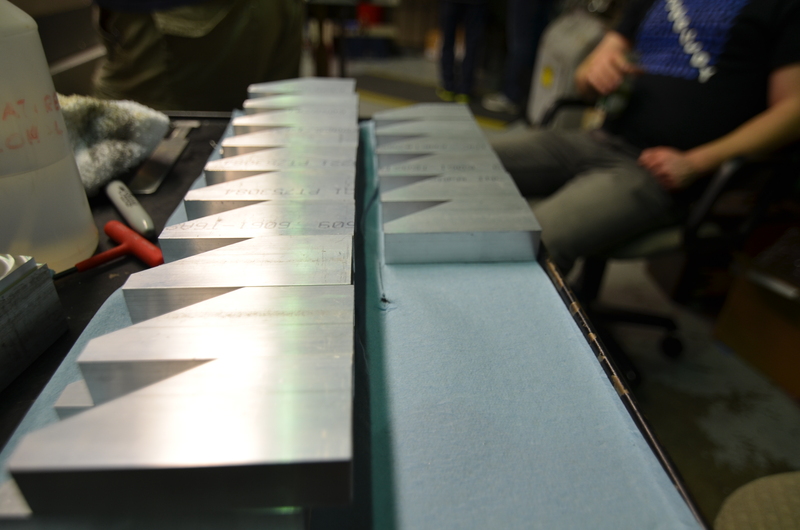 Today was largely focused on the manufacturing of various aluminum parts for the drive chassis and prototypes. 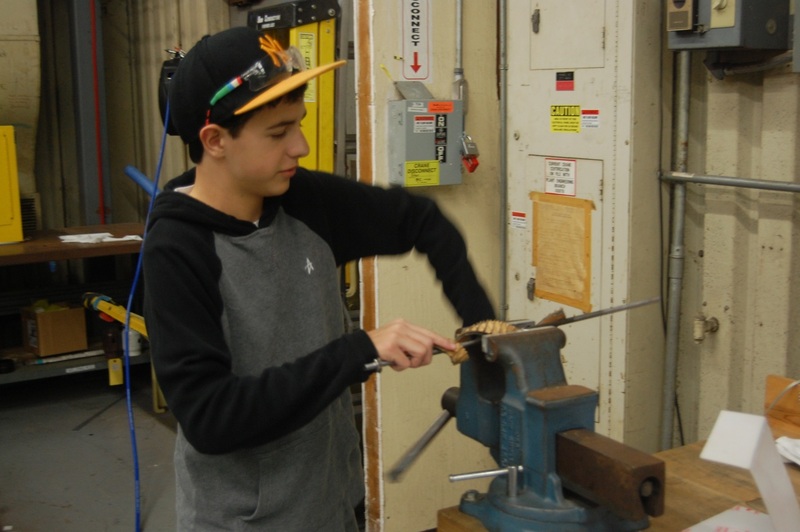 Students used the mill, lathe, and other machines to manufacture parts. 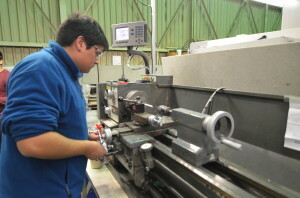 The lathe was used to create axles for drive gearbox. In addition, students scotch-brited bearing housings and deburred parts. 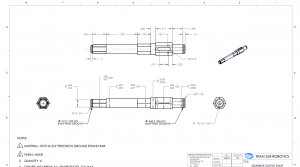 Students continued designing the robot bumpers in Solidworks. The pool noodles and wooden frame of the bumpers were designed, but the team still needs to create a couple more pool noodles. Upon their completion, the noodles and the frame will be assembled in Solidworks. Other students created weld drawings for drive chassis. The programming team conducted tests of the VEX light sensors. 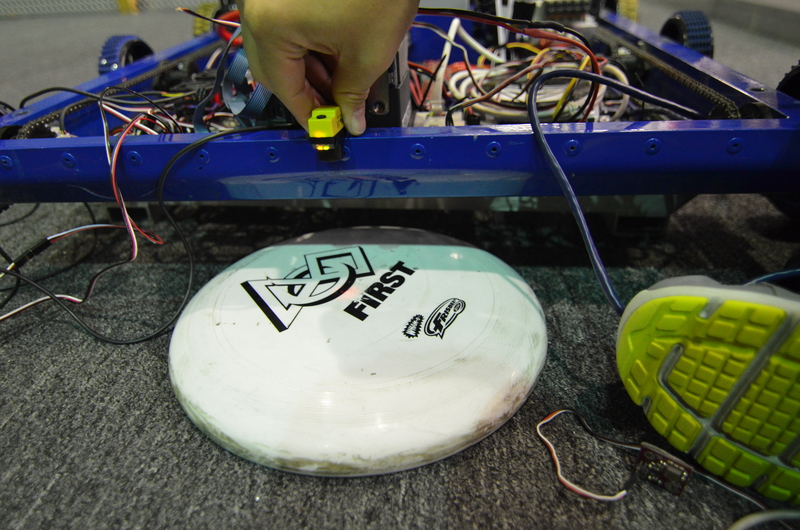 The team hopes to use some sort of sensor to check whether a frisbee in the shooter is right-side-up or upside-down. However, the VEX light sensors seemed to have a difficult time differentiating between the two. The error margin or difference between the two values were too small and close to be used effectively. The team believes that the ambient light in the NASA lab may have contributed to this. Next, the team tried connecting a photoelectric sensor to the robot for testing. However, there may have been an error in wiring or code that gave the students inconsistent and incorrect values. The team will look more into infrared sensors to accomplish the goal. Today we made a few more changes to the shooter. We decided to return back to the larger, treaded wheels. Students disassembled the shooter and retreaded the wheels. Students also added snapring grooves onto the shafts. The shooter just needs to be reassembled and tested. 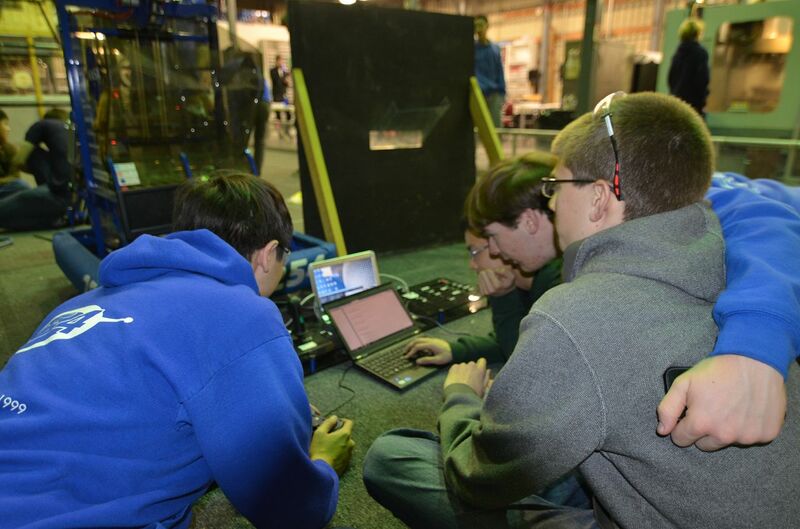 The programming team worked on a program to read constants from a text file into the robot software. This has been written and mostly finished, but remains untested. Since the cRIO runs only Java ME, an outdated version of Java compared to SE, the programmers spent a lot of time rewriting and reimplementing functions like String's split method. Meanwhile, other students continued debugging the Smart Dashboard widget and FTP connection, but had problems using the program on the driver station and other laptops. Oddly, the FTP upload and download works on one of the student's laptops, but not any of the others. More tests will be conducted to get to the root of this issue. Programmers also began testing sensors for use on the 2013 robot. The gyro was removed from Skyfire and added to the 2010 robot for temporary testing purposes. Tomorrow, the team plans to test the S5 encoders and other sensors by printing out the values of the sensors to a console. This will also serve as a quick lesson on programming sensors for new and old programmers alike. 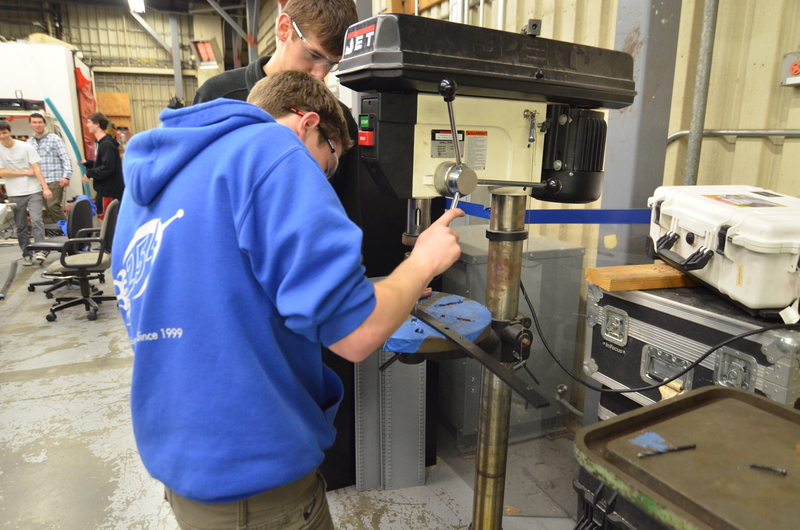 Not much CAD work was done today as we focused mainly on machining the drivebase. 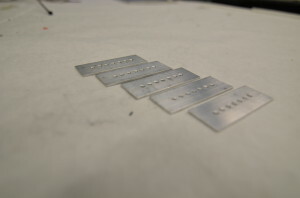 Today students did a lot of machining. They used the mill and drill press to create the Bumper Support Caps, which will get welded onto the drivebase. Students also used the lathe to cut down standoffs for the gearbox and to add snapring grooves the prototype shooter's shafts. A group of students also finished scotch-briting the bearing-housings. The CNC was used to make the final cuts onto the Bumper Supports. Continue Manufacturing Parts, especially parts for drivebase. This is the second post, of a series of posts, related to the delicious baked goods eaten at the lab. We love baked goods and yummy foods. In response to this, we will be posting the recipes of some of the treats brought to the lab. The second recipe is a delicious (and questionably nutritious) way to start off the season. This delectable cake is specially formulated to enhance the prototype-making areas of the brain, so that's what we snacked on this past weekend. Cream butter and sugar. Add vanilla and eggs; beat. Add flour and baking powder and mix well. Add chocolate chips and milk, stirring slowly. Bake at 350°F in a large circular (cheesecake) pan or a 13"x9" rectangular pan for 35-40 minutes, or until an inserted toothpick comes out clean. We had an excellent turnout of students today, which helped get a lot done. The chassis needs to be completed by Monday to be sent out for welding. There are a few more parts that need to be completed for the chassis. 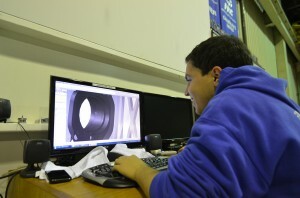 Students worked on completing the covers for the bumper mounts. These parts were manufactured on the manual mill. They also finished the parts for the battery box (which is part of the chassis weldment). 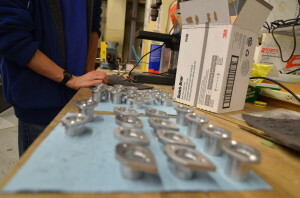 On the CNC, the bumper mounts were being completed. These parts are a little more complex and take some time. They have been in progess for the past two days. There are a few changes that need to be made on the shooter prototype, none of which were completed last night. The biggest change is going to be the increase in speed for the front wheels. The previous wheels were geared 2.3:1 making them spin at approximately 10,000 rpm. 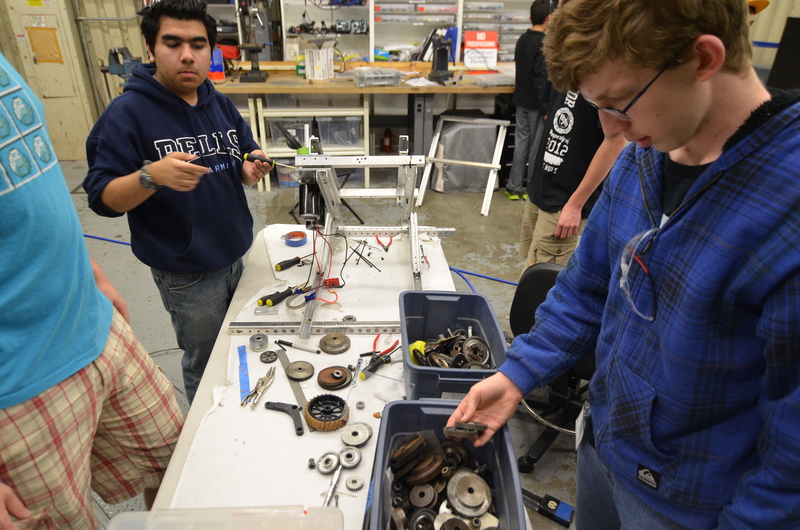 The wheels were changed to a smaller radius and a new mounting plate for the motors is in progress. 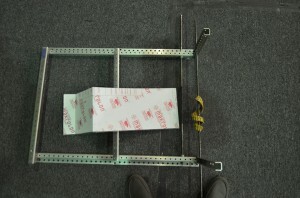 This mounting plate will accomodate a BAG motor which spins at 14,000 rpm (free speed). It will be geared up a little to spin at 17,000 rpm. When accounting for efficiency and load losses, it will spin at approximately 15,000 rpm, which is the desired goal. The shooter will also be turned upside down (little progress was made on this yesterday) to test if it is possible to load the frisbees upside down. A new intake was designed today, to match the concept intake that is currently in the CAD model. This intake has a new funneling method by implementation. By concept, it is the same (where one frisbee goes in faster than the others). Previously, there were perpendicular belts that moved a frisbee ahead of the other one to allow the intake to funnel from two frisbees to one. On this current intake, the horizontal belts were replaced with four rollers. These rollers were shaped in a funnel as well. It was decided that the two frisbee wide intake will not be used. At any point in the match, there will not be two frisbees that will go in at exactly the same time, so the intake does not need to be two frisbees wide. 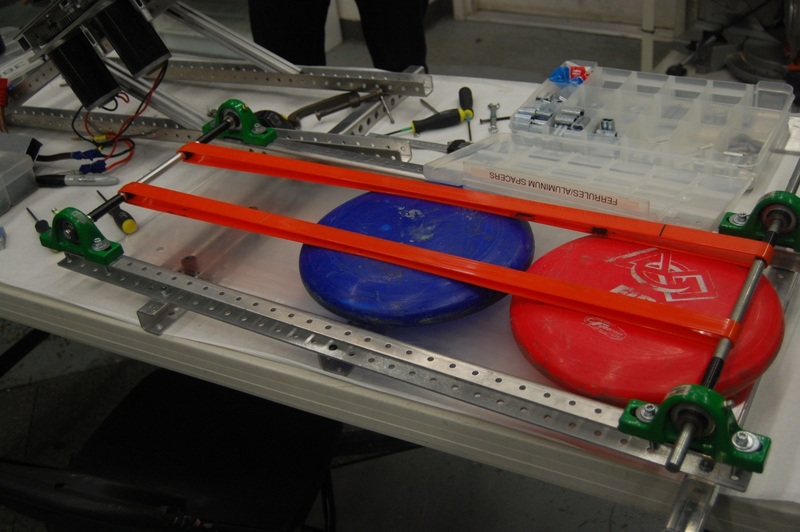 During autonomous, the robot will drive towards the frisbees diagonally to intake them, rather than go straight on. Students made an intake with these four rollers that replicated the "drop-down" motion that will be needed when the intake goes from "stowed" to "engaged." There is still a lot of work to be done. The structure was completed, the rollers were mounted, and the pivots worked. Its a matter of improving the concept to see what works and what doesn't. Students did a lot of testing with sensors today. They wired in different sensors to check if they still worked. One of the most significant progresses they made today was with the use of the banner sensor. As you can see below, they used the banner sensor to detect whether the frisbee is upside down or right side up. This will come in very useful for this year's shooter, as shooting upside-down frisbees is slightly different than shooting right-side-up frisbees in terms of their trajectory and necessary velocity. The two pictures below demonstrate their progress. In the picture to the left, the frisbee is upside down. However, the little orange light to the left of the green light on the banner sensor (yellow box held by hand) is off. In the picture to the right, the little orange light is on, which means the frisbee is right side up. In the off position, the sensor value returns false; in the on position, the sensor returns true. Since this banner sensor can detect only two states (frisbee upside down or no frisbee, and frisbee right side up), the team is looking into either using two banner sensors or one analog sensor that can help detect three states. In addition to banner sensors, the programmers tested two gyros, both of which worked well. Next, the team wanted to test S5 encoders, but the wire to connnect this encoder to the digital sidecar needs to be soldered or modified. The S4 encoders are the last on the to-do list, which will happen tomorrow. In other news, students finally got the Smart Dashboard constants extension working on the driver station laptop. This would allow the team to upload new constants' values to the robot via FTP in a text file, so that re-compiling or re-deployment would not be necessary to change one little value. 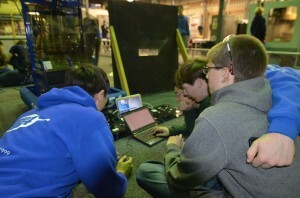 The team originally had issues with the FTP connection from the driver station laptop to the robot (specifically, a socket write error), but the programmers discovered that completely disabling the firewall did the job. While the programmers have a working system to send text files to the robot, a method of reading constants and values from the text file and updating them is still required. The code to do so has been completed today after successfully rewriting the String class' split method. Though the system seems to work on the students' laptops, the next step for this is to actually test it on the robot and confirm that the hard-coded constants are actually being updated. 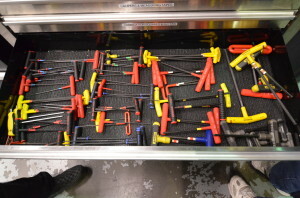 Other students worked on organizing the tool chest, which turned out to be very helpful. They took the tools out and laid them neatly back in the chest. The shooter protoype is coming along as students worked to test an added polycarb cover. To test the effectiveness of smaller wheels on the shooter, a group worked on replacing the treaded wheels with Banebots wheels. Tests proved favorable for the treaded wheels. Leaders and students continued to test the intake system. Tests utilizing a single roller intake have proved successful. 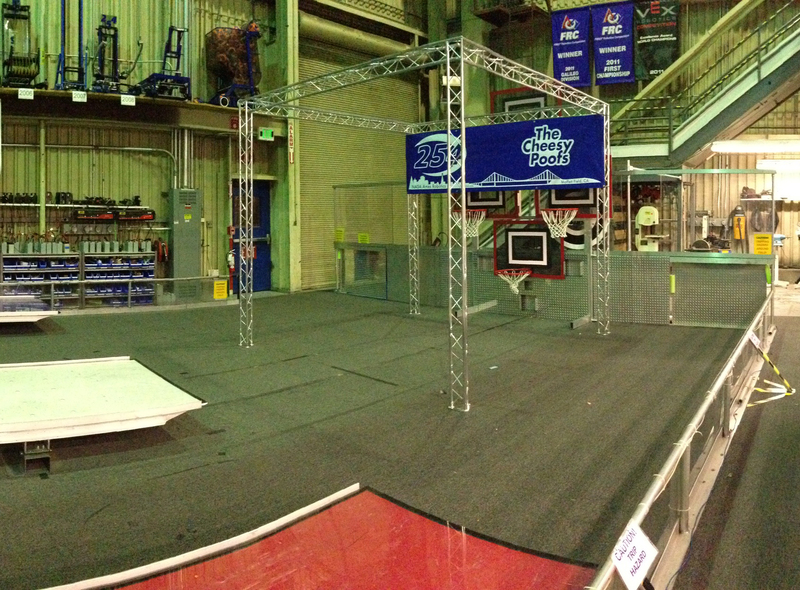 Students added an elevated mount to mimic the path that the frisbees will have to travel in order to enter the robot. 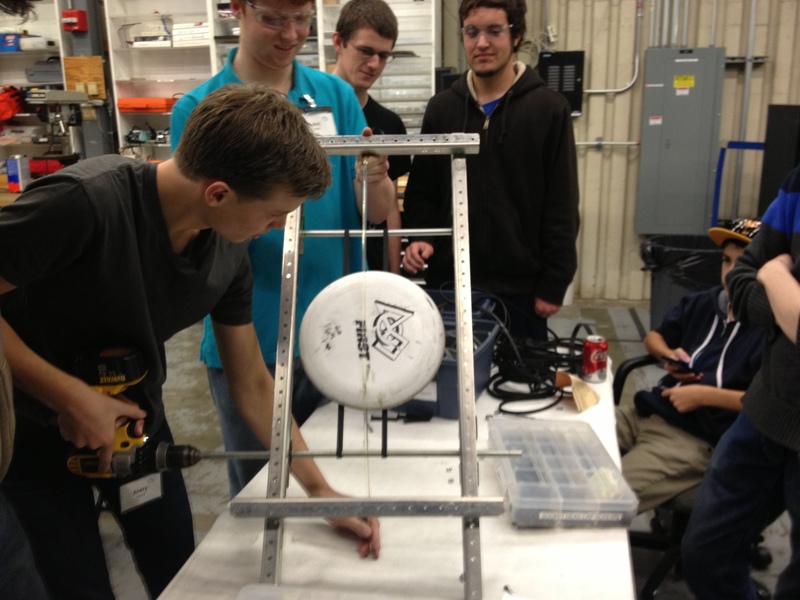 Tests in intaking multiple frisbees have proved successful and steps are being taken to improve on the design. Students progress by printing messages from the robot to the driver’s station control board. The programmers worked on some code to allow the driver’s station to cycle thorugh different autonomous modes. The “Y” button on the Logitech F310 joystick was mapped such that while the robot is disabled, a driver station user message line would display the current autonomous mode. This ended up working quite well with the available commands the team had already: drive distance and wait. Meanwhile, the team also took time to strip and crimp a five-wire encoder wire into two female PWM terminals. This would allow the programmers to plug the S5 encoders into the digital sidecar to test the team’s S5 encoders. Unfortunately, this has yet to be completed; testing will occur tomorrow to ensure that both the wiring and encoders work. Through diligent work by students the CAD for this year’s bumpers are nearly complete. 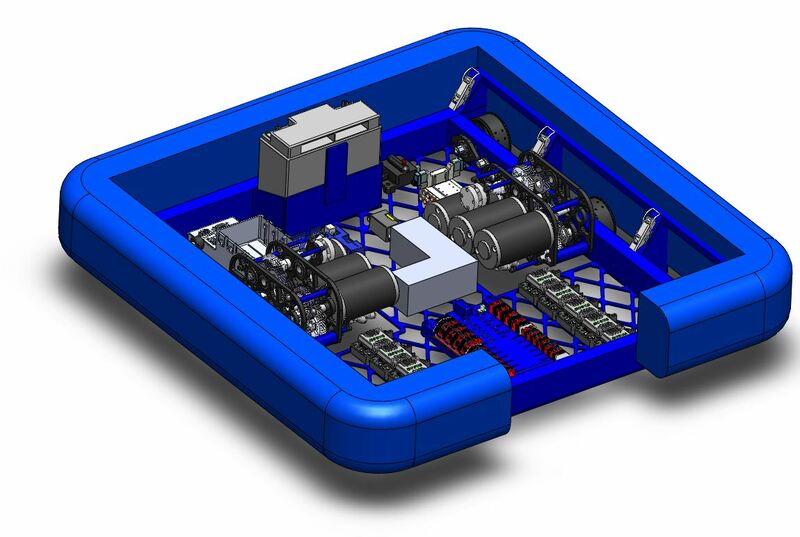 Students and mentors have continued to work in Solidworks to design our robot’s drivebase. 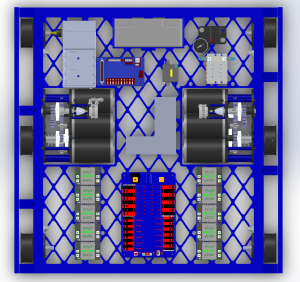 Progress was made by adding electrical components to the CAD to map out the distribution of speed controllers, CRIO and pneumatic systems placement, and the power distribution board.